Some stories (like some photographs) are just too irresistible to ignore. 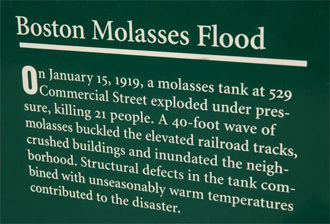 The Great Molasses Flood is one such story. The year was 1919. The Great War was over, the Red Sox had won the World Series in 1918 and all was right with the world. Boston was teeming with life, particularly at the harbor. January 15th was a beautiful day. There was no snow on the ground and the temperature was hovering around forty degrees. A few days earlier, two-and-a-half million gallons of molasses had been delivered to Purity Distilling Company in Boston from Puerto Rico. It was thought to be secure in a tank fifty feet high and 240 feet around. Made of steel and held together by heavy rivets, the tank was located on Copp’s Hill just above the harbor in what is now the Italian North End. The molasses would be used to make ammunition, rum and topping for pancakes. Traffic in the area was heavy. Ponderous trucks and large, cumbersome wagons filled streets in the harbor area. Folks were busy outside. Everyone seemed to be taking advantage of the terrific weather. Around noon, many area workers took their lunch outdoors. At 12:30PM, folks heard a groan, then a muffled roar. 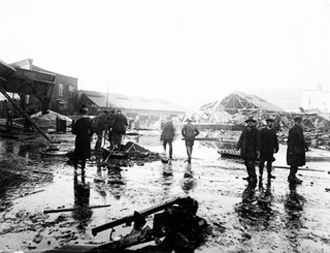 The once-chilled mass of molasses had expanded in the tank, and the tank exploded. War veterans said the popping rivets sounded exactly like machine gun fire, as the deadly projectiles and shards of the tank exploded outwards . One section of the tank was tossed across Commercial Street taking out supporting structure of the El. The train was nearing the location and rumbled to a stop just before reaching the molasses wave. Another piece of tank crashed into a freight house directly behind some of the workers who had been lunching only moments before. 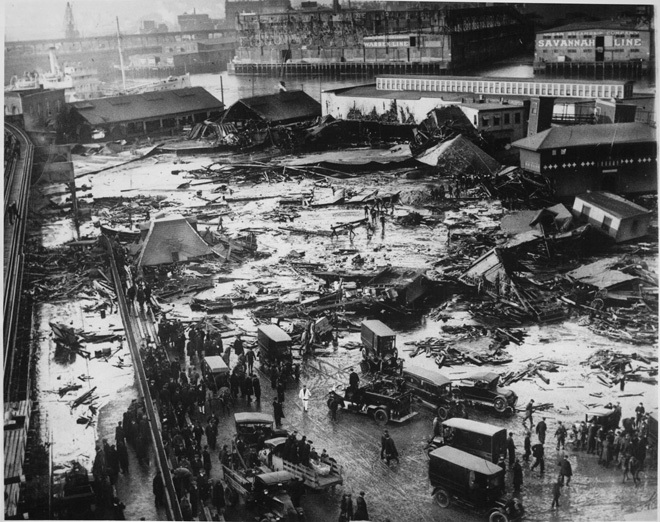 The fifteen foot high cascade of molasses weighed over 14,000 tons. It rolled across the streets and into houses, collapsing at least one house and crushing an occupant. The wave, estimated to be traveling at some thirty-five miles per hour, was so fast it caught three children walking home from school. One boy “surfed” the molasses for several feet until he was rolled under it like a pebble. When found, he was thought to be dead and placed on the ground next to the other bodies. However he was very much alive, but his sister had been killed. 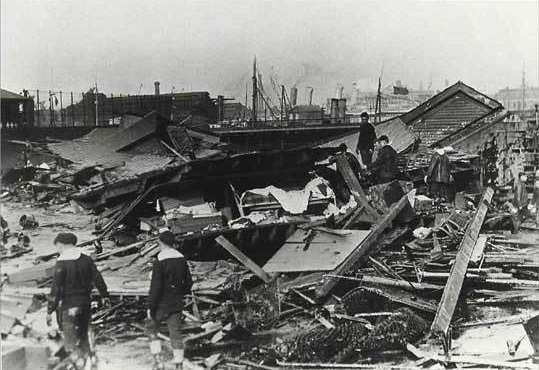 Wagons, horses, and bodies were swept by the brown tide down the hill and into the harbor. 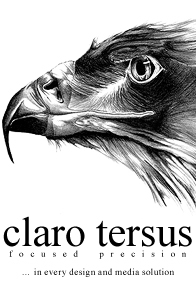 The final count was twenty-one dead, 150 injured, and numerous horses killed. A great part of the glob rolled across Commonwealth Street and into the harbor waters. It took several days of high pressure hosing from fire boats firing salt water to clean up the major portion of the mess. The problem was that the sticky substance got over everything in greater Boston - from train tracks to telephones poles. In total it took over 87,000 man-hours to clean the area although it was said to remain sticky to the touch and sweet smelling for several years after. The cause of the explosion? Structural deficiencies in the tank, and the unusually warm weather which caused the molasses to expand, exerting further pressure on the weakened tank. Purity eventually paid a million dollar settlement. Today, all that remains is a simple plaque at the intersection of Foster and Commercial Street, a small reminder of one of the most unusual accidents in New England history.